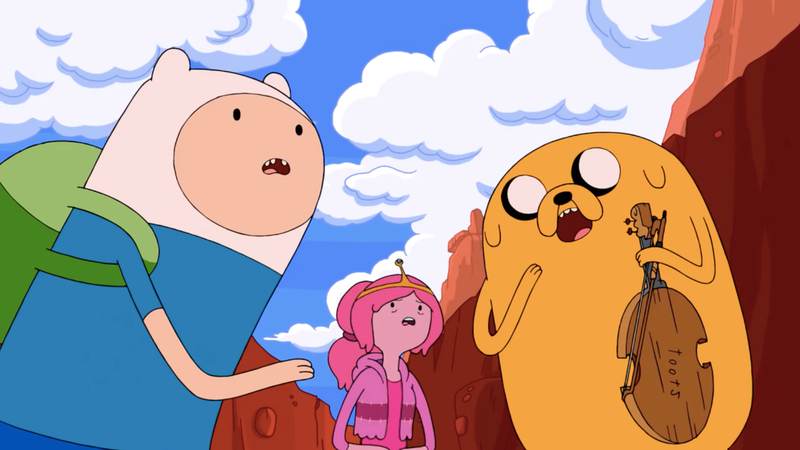 Though Adventure Time’s series finale brought Finn and Jake’s televised adventures to an end this week, the event also confirmed one of the most interesting and longstanding theories about the show that astonished and delighted many fans. After multiple seasons of hints, clues, and varying amounts of queer subtext, Adventure Time’s finale confirmed that Princess Bubblegum and Marceline the vampire have romantic feelings for one another and are destined to be together. During a climactic battle against GOLB, a powerful and malevolent being from another dimension hellbent on destroying Ooo, Marceline watches as Bubblegum is apparently crushed, prompting the vampire to fly into a fit of rage before she realises the princess is actually fine thanks to her armour. The two embrace and Marceline admits that she feared she’d lost Bubblegum forever. After assuring Marceline that it’d take more than that to destroy her, the pair share a tender kiss. And it made “Bubbeline” fans very happy. While the moment was sure to vindicate Adventure Time fans who’ve been shipping the characters pretty much since they first appeared on screen together, the show’s creative team was unsure of how to handle it. In an interview with TVLine, executive producer Adam Muto explained how, initially, an explicit kiss wasn’t even a planned part of the episode — the script, he said “didn’t say that they kiss. It just said they ‘have a moment’” — and it wasn’t included until storyboard artist Hanna K. Nyström made a point of advocating for it. There’s enough to draw a conclusion. I don’t want to lay out their entire future — what their relationship will be like after this, and all that — but there are enough pieces there that you can kind of construct what their life will be like going forward. We knew that if we put this in, it would get some attention. But would it be too much attention? … Or would we be downplaying it too much? We knew we wanted to incorporate it, and in the end, you just have no control over how people will remember things. Given how loudly the Adventure Time fandom has been pushing for Princess Gumball and Marceline’s love to become part of the show’s canon, Muto’s comments are a little odd because it’s clear that the show’s creative team was at least partially concerned about potential negative backlash. Muto admitted that the evolution of “Bubbeline” has a lot to do with Steven Universe creator Rebecca Sugar’s previous involvement on Adventure Time, where she was fought for the character’s relationship to become more complicated. Steven Universe, in particular, has proven that there’s definitely an audience for these shows centrally featuring queer characters and their relationships — and so hopefully, when the next show like Adventure Time makes its way onto TV, it won’t wait until the finale to give fans what they want. I'm 15 years old and watched this when I was younger - whenever my grandfather hadn't deleted the Foxtel recordings. I'm saddened by this for some reason. The Legend of Korra did exactly this as well. It's more than a bit sad that authors have to hide this kind of stuff til the last hurrah because of fear of retribution. Yeah, but it's less likely now. It's moving in the right direction. I think most people don't care one way or the other, as with most things, it's just a handful of vocal ones now. lol I'd say it's getting too much attention.